334 Beacon is located on the NW corner of Beacon and Fairfield, with 330 Beacon to the east, across Fairfield, 336 Beacon to the west, and 351 Beacon to the south, across Beacon. 334 Beacon was designed and built ca. 1872 by architect and builder Frederick B. Pope for speculative sale on land he purchased on September 8, 1871, from the Boston and Roxbury Mill Corporation. The property was numbered 332 Beacon until about 1889. Click here for an index to the deeds for 334 Beacon. On November 3, 1873, 334 Beacon was purchased from Frederick Pope by dry goods merchant John Stratton Wright, a widower, whose primary residence was in Nahant. He died in June of 1874 and may never have occupied the house. On December 2, 1874, 334 Beacon was purchased from John Wright’s estate by retail clothier Leopold Morse (born Maas). He and his wife, Georgiana (Georgie) Louisa (Ray) Morse, lived at 49 Beacon; in the mid-1880s, they would build a home at 203 Commonwealth. On January 11, 1875, 334 Beacon was purchased from Leopold Morse by Cyrus Turner Clark, a painting and decorating contractor. He and his wife, Hannah M. (Tirrell) Clark, lived at 67 Worcester. On January 1, 1876, 334 Beacon was purchased from Cyrus Clark by real estate dealer Benjamin Gleason Reed. On June 3, 1876, 334 Beacon was purchased from Benjamin Reed by leather and morocco dealer David Locke Webster and his wife, Joanna (Ryder) Webster. They previously had lived at 12 Hancock. Joanna Webster died in April of 1890. 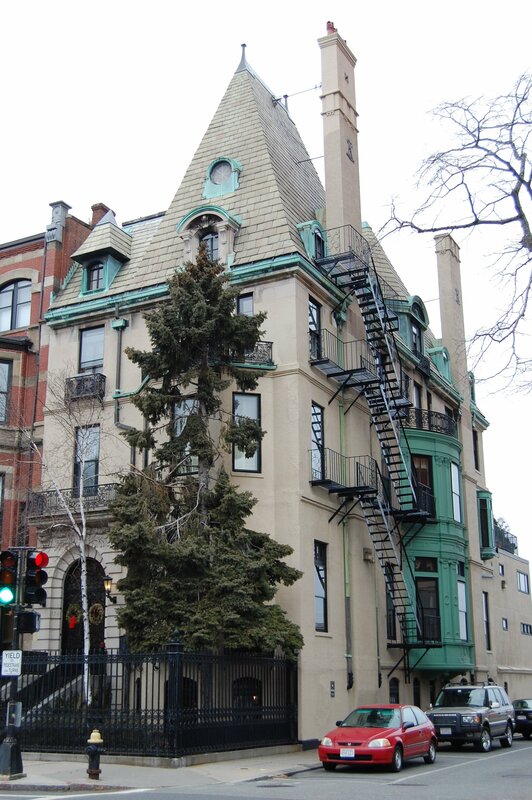 David Webster continued to live at 334 Beacon and, by the 1890-1891 winter season, had been joined there by his son and daughter-in-law, Andrew Gerrish Webster and Lizzie Florence (Briggs) Webster. They previously had lived at 247 Newbury. Andrew Webster was a leather merchant in partnership with his father. Also living with David Webster was his niece, Mary I. Webster. She was the daughter of his brother, Andrew Jackson Webster, and his wife, Mary A. (Littlfield) Webster. Andrew and Lizzie Webster continued to live at 334 Beacon during the 1896-1897 winter season, but moved thereafter to an apartment at 330 Dartmouth. They resumed living with his father at 334 Beacon in about 1902. They also maintained a home in Cohasset. David Webster died in April of 1903. Mary Webster had continued to live with him until his death. 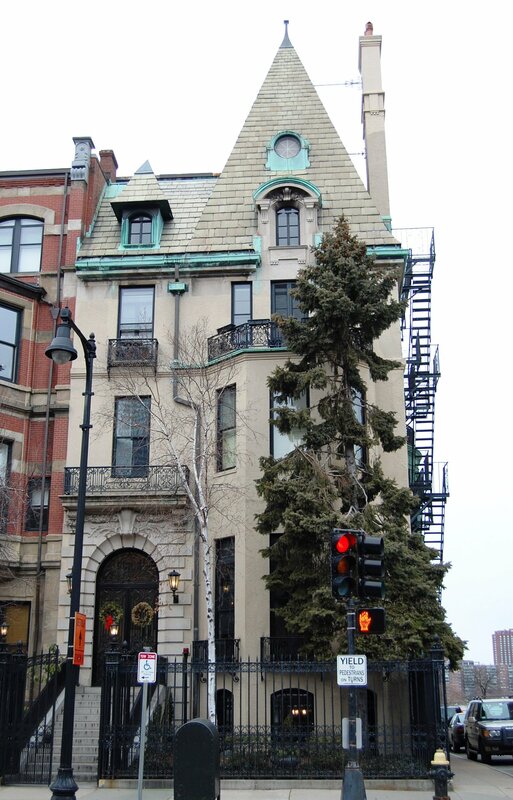 Andrew and Lizzie Webster continued to live at 334 Beacon during the 1904-1905 winter season. By 1906, they had moved to an apartment at 373 Commonwealth. 334 Beacon was not listed in the 1906 Blue Book. On March 20, 1905, 334 Beacon was purchased from David Webster’s estate by Clarence Walker Barron. He and his wife, Jessie Maria (Barteaux) Waldron Barron, made it their home. They previously had lived at 253 Newbury. In the early 1900s, Clarence Barron had acquired control of Dow, Jones & Company, publishers of the Wall Street Journal, of which he became president in 1912. In 1921, he established Barron’s National Financial Weekly. Jane and Martha Waldron-Barron, the daughters of Jessie Barron by her first marriage (to Samuel Wallis Waldron), lived with them. Jane Wallis Waldron-Barron married in January of 1907 to Hugh Bancroft, a lawyer, and they moved to 253 Newbury. Martha Waldron-Barron married in October of 1911 to Henry Wendell Endicott, a shoe manufacturer, and they moved to Dedham. She died in October of 1916 and H. Wendell Endicott and their infant daughter, Martha, moved to 334 Beacon to live with his in-laws. Jessie Barron died in May of 1918. Clarence Barron and H. Wendell Endicott continued to live at 334 Beacon and in Cohasset. H. Wendell Endicott married again in September of 1925 to Priscilla Maxwell. They lived at 334 Beacon during the 1925-1926 winter season, but moved thereafter to Dedham. Clarence Barron continued to live at 334 Beacon and in Cohasset until his death in October of 1928. He left 334 Beacon to his grand-daughter, Martha Endicott. He left his Cohasset home to his grand-daughter, Jessie Bancroft, and his Cohasset farm properties to his son-in-law, Hugh Bancroft. 334 Beacon was not listed in the 1929 and 1930 Blue Books. On October 23, 1930, 334 Beacon was purchased from Martha Endicott by the estate of Andrew W. Preston, president of the United Fruit Company, who had died in September of 1924. 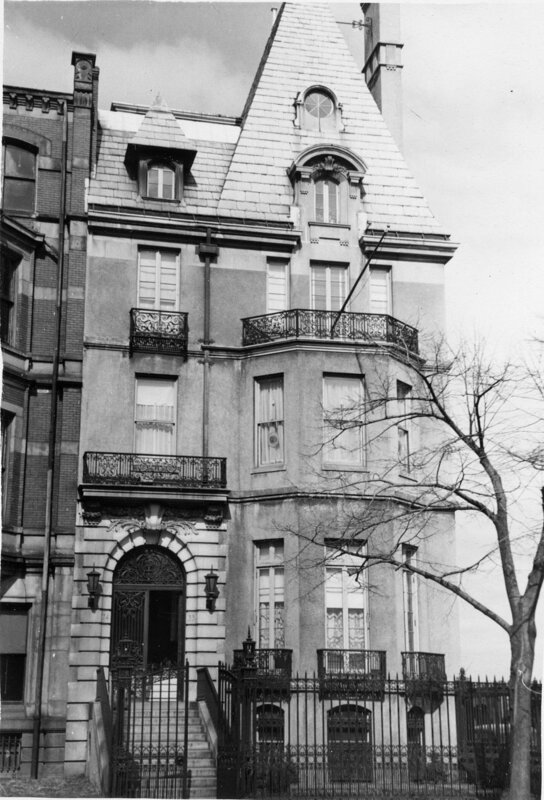 334 Beacon became the home of Andrew Preston’s son-in-law and daughter, Harold G. Cutler, a stock and bond broker, and Bessie Woodbury (Preston) Ong Cutler. They previously had lived at 52 Fenway. They also maintained a home, Dorrich, at Beach Bluff in Swampscott. Bessie Cutler’s three children by her first marriage, to Eugene Walter Ong, lived with them. Eugene and Bessie Ong had divorced in the early 1920s, and their three children had been adopted by her father and took the surname Preston. Harold and Bessie Cutler had separated by 1937. She continued to live at 334 Beacon with her three children: Dorothy, Richard W., and Patricia Winifred Preston. She also maintained a home, Seven Pines, in South Hamilton. Patricia Winifred Preston married in January of 1938 to Farley Wilder Wheelwright, and Richard W. Preston married in January of 1939 to Martha Proctor. Bessie Preston Cutler continued to live at 334 Beacon until about 1939. Her daughter, Dorothy Preston, lived with her. By 1941, when Dorothy Preston married Charles P. Ware, they were living in Hamilton. 334 Beacon was shown as vacant in the 1940 City Directory. On October 16, 1940, 334 Beacon was purchased from Andrew Preston’s estate by real estate dealers Warren-Stevens, Inc., and on November 1, 1940, it was acquired from Warren-Stevens Inc. by Margherita (Ercolani) Grilli, the wife of Silvestro (Silvio) Grilli, a manager and later vice president and manager of Pieroni, Inc., restaurant operators. They lived at 282 Commonwealth. In November of 1940, Margherita Grilli applied for (and subsequently received) permission to convert the property from a single-family dwelling into lodging house. 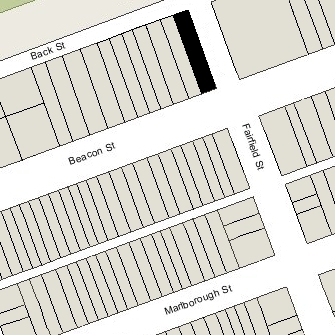 Based on City Directory entries, it appears to have been converted into six apartments by 1942. From about 1941 through 1947, the Grillis lived in one of the apartments at 334 Beacon. They continued to own 282 Commonwealth and moved back there in about 1948. In September of 1942, Margherita Grilli’s nephew, Luca J. P. Fioravanti (the son of Louis (Luigi) Fioravanti and Rosina (Ercolani) Fioravanti), acquired 336 Beacon. That same month, Margherita Grilli filed for permission to cut doors in the party wall connecting 334 Beacon with 336 Beacon on the first and third floors. This complemented a similar filing in August of 1942 by the Massachusetts Hospital Life Insurance Company, from whom Luca Fioravanti had purchased 336 Beacon. This proposal, probably designed to provide egress for both houses, was abandoned, and, instead, Massachusetts Hospital Life applied for (and subsequently received) permission to build fire balconies connecting with 338 Beacon. Based on City Directory entries, the number of units at 334 Beacon appears to have increased to ten by the mid-1940s and to twelve by the late 1950s. On October 11, 1948, Margherita Grilli transferred 334 Beacon to herself as trustee of the Three Thirty Four Trust. In November of 1955, she acquired 336 Beacon from her nephew, and on May 28, 1958, she transferred both 334 Beacon and 336 Beacon to herself as trustee of the Grilli Realty Trust. Margherita Grilli died in December of 1960 in Rome. Silvestro Grillo subsequently moved to one of the apartments at 334 Beacon. He died in May of 1966. In April of 1980, Harold Brown filed for (and subsequently received) permission to legalize the occupancy of 334 Beacon as fourteen units.